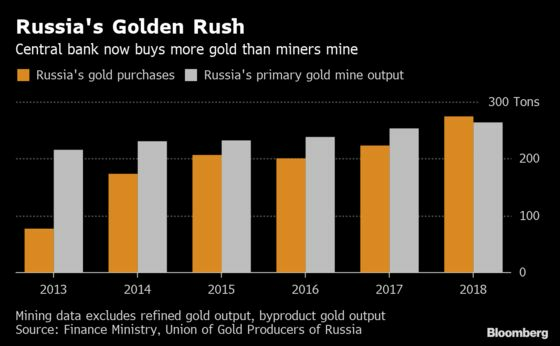 (Bloomberg) -- Vladimir Putin’s quest to break Russia’s reliance on the U.S. dollar has set off a literal gold rush. Within the span of a decade, the country quadrupled its bullion reserves, and 2018 marked the most ambitious year yet. And the pace is keeping up so far this year. Data from the central bank show that holdings rose by 1 million ounces in February, the most since November. The data shows that Russia is making rapid progress in its effort to diversify away from American assets. Analysts, who have coined the term de-dollarization, speculate about the global economic impacts if more countries adopt a similar philosophy and what it could mean for the dollar’s desirability compared with other assets, such as gold or the Chinese yuan. French President Emmanuel Macron said in an interview with CNN in November that European corporations and entities are too dependent on the U.S. currency, calling it "an issue of sovereignty." Last year, Poland and Hungary surprised analysts by making the first substantial gold purchases by a European Union nation in more than a decade. For Russia, experts are starting to question whether it can afford to keep up its intense pace of buying. Some say the country will import more gold to guard against geopolitical shocks and the threat of tougher U.S. sanctions as relations between the two powers continue to deteriorate. Gold buying last year exceeded mine supply for the first time. Still, others argue that Russia’s bullion demand is set to slow. “Should it reach the limit for domestic purchases, I think the central bank will start to import gold,” said Oleg Kouzmin, chief economist at Renaissance Capital in Moscow and former adviser in the central bank’s Monetary Policy Department. Given the geopolitical risks, it’s likely the central bank will keep increasing gold’s share of reserves, he said. The central bank bought 274 tons of bullion last year, according to the World Gold Council. That’s worth more than $11 billion at average prices. Russia accounts for 40% of central bank gold buying and 6% of global demand. 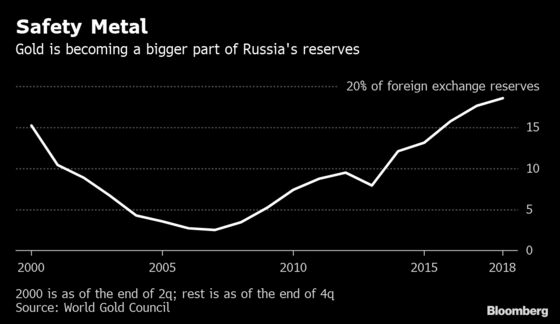 Gold accounts for about 19% of Russia’s foreign-exchange reserves, the highest level since 2000. Dollars represent 22% of the reserves, down from 46% in mid-2017. A representative for Russia’s central bank declined to comment on its gold purchases. One thing that could keep Russia’s dollar reserves at high level is the country’s dependence on exporting commodities, like oil which are denominated in the greenback. Three-quarters of the nation’s annual $600 billion of trade is in dollars. Read: Putin Push to Dump Dollar Proves Hard Sell With Russia Inc.
Central bank buying has helped “strengthen gold from a weak hand to a strong hand” and supported gold prices in recent years, according to Ronald-Peter Stoeferle, managing partner at Liechtenstein-based asset manager Incrementum AG. Bullion has risen more than 20 percent since the start of 2016. It traded up 0.5 percent at $1,297.15 per ounce at 12:40 p.m. in London.